ON THIS DATE (May 1, 1992) ... The Red Sox overcame 4-0 and 5-4 deficits and overhauled the Kansas City Royals, 6-5 on May 1st. 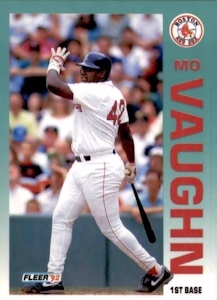 The Fenway Park crowd of 27,973 went home cheering Mo Vaughn, who won the game with a bases-loaded, two-run single with none out in the bottom of the ninth. But if that's all they noticed, they missed a lot. For instance, there was a fast start by KC's Mark Gubicza, who struck out four while retiring the first nine batters. But in the sixth inning, he faltered and gave way to a porous bullpen that fell apart against a 12-hit Red Sox assault. Boston chipped away and tied the game at 4-4, fell behind in the top of the ninth, then won it against Jeff Montgomery, one of the American League's best closers. Another highlight was the rebirth of Jack Clark. Lifted from the starting lineup for a night, he had a pinch single and a game-tying sacrifice fly on his ledger, which turned all those jeers to cheers. The Red Sox executed a hit-and-run play, and runners scrambled from first to third like seasoned jackrabbits. Bob Zupcic set up the winning hit in the ninth with a perfect bunt. The unraveling of the Royals, baseball's worst team, started in the sixth when Gubicza walked Luis Rivera. After a double by Wade Boggs, a single by Reed and a wild pitch, the Sox were within 4-2. Runs in the seventh and eighth tied it. The Sox made it a one-run game in the seventh inning after a one-out single by Clark, pinch hitting for Scott Cooper. Rivera flied out, but Boggs walked. The Royals brought in former Red Sox starter Mike Boddicker to relieve, and Reed then came through with his third hit of the night, a single to left, scoring Clark and making it 4-3. In the eighth, Vaughn singled with one out and went to third on a hit-and-run single by Pena. Again, Clark did the job, hitting a sacrifice fly off Montgomery. Kansas City regained the lead in the top of the ninth on a single by Mike Macfarlane, a sacrifice and a single by Keith Miller. That set the stage for the dramatic finish, which began when Plantier walked to lead off. Ellis Burks followed with a single, and both runners moved up on Zupcic's bunt. Montgomery threw late to third base in an attempt to force Plantier, loading the bases. Vaughn followed with the winning hit.